Retriever Communications, a pioneering leader in mobile field force automation technology in Asia Pacific and Europe since 1996, announces today that it has partnered with MSI Data to bring its technologically advanced field mobility platform to the United States. The new Retriever and MSI Data partnership connects Retriever Enterprise™, Asia Pacific (APAC) and Europe’s most technologically advanced enterprise platform for rapid development of field service mobility applications, with MSI Data, a leading provider of field service management software and depot repair software to the North American marketplace. 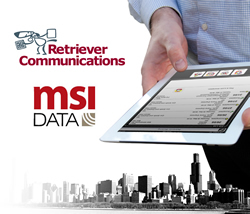 Both MSI Data and Retriever Communications have long histories in providing mobile applications that utilize the latest technologies to automate work flow and paperwork for organizations with hundreds to thousands of field workers. For large commercial, industrial and institutional enterprises seeking field service, inspection or other field workforce productivity gains, Retriever offers an advanced, feature-rich and secure toolset for rapid development of mobile applications, and a wide array of deployment options. The Retriever platform allows enterprises to deploy for any device running the iOS®, Android® or Windows Mobile® operating systems, including tablets, rugged PDAs and smartphones. Retriever solutions integrate with any back-end system with a focus on customizability, and are offered in both SaaS and licensed software options. Utilizing Retriever's application development technology, MSI Data will be working with United States customers from implementation to ongoing support, backed by Retriever's Houston and Sydney offices. With 24 hour support, Retriever and MSI Data are committed to building successful long term relationships with all clients. MSI Data develops enterprise, scheduling and mobile software that helps companies improve the productivity of their field workforce. World class service organizations such as Time Warner, Bradley Corporation, Tax-Air and Heartland Computers rely on MSI Data's powerful suite of field workforce software to automate field service, inspections, site surveys, audits, reporting and other critical field-driven business processes. MSI Data replaces paper and spreadsheet-based business processes with highly efficient, end-to-end processes through the combination of mobile technology for field workers and ERP, CRM and accounting systems integration. Whether deployed in the cloud or on-premise, MSI field workforce software applications are easy to acquire, easy to deploy and deliver enterprises with rapid return on investment. To learn more, please visit http://www.msidata.com. Retriever Communications is a leading field force automation company that has received substantial international industry recognition. Pioneering the technology since 1996, Retriever continues to be the leader in wireless field technology to improve field worker productivity through seamless integration. Retriever automates field worker processes from scheduling to wireless in-field applications operating on rugged and consumer grade mobile devices with support for Windows mobile, iOS and Android operating systems. Today Retriever maintains its international focus with local offices in Sydney, London, Milan and Houston - supporting deployments in over 21 countries. Our customers tell us our differentiation remains in the breadth of our product capability, scalability and reliability. Importantly our product is underpinned by a high quality of service ethic that can be referenced with our customers. For more information on how Retriever and MSI Data can automate workflow in your organization or to request a demonstration, please visit http://www.retrievercommunications.com or email sales(at)retrievercommunications(dot)com.